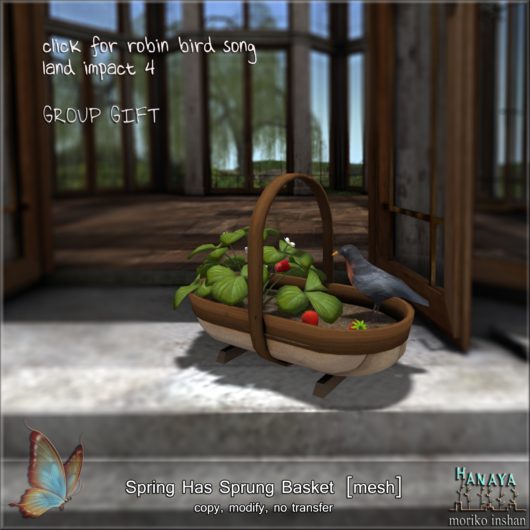 Two more new spring decorating releases at -Hanaya- in-world store and on the Second Life Marketplace. The summer version of our classic three tier fountain is a stunning water feature for residences and commercial areas. Water bubbles from the top finial, trickling into pools of gently rippling water. The fountain’s wavy rims have divots to direct thin streams of water to the tiers below – touch to turn sound on and off. Land impact 12 at provided size including the base. Do you think you can find room for this little welcome sign at your front door? A robin chirps happily, and perennial plants have shot up out of the ground to cheer visitors. Land impact of 4 for the set. Both the fountain and the welcome sign are on display at our in-world store and also available on the Second Life Marketplace. If you buy in-world and belong to the -Hanaya- VIP Group please activate your group for 20% discount. This entry was posted in Product Announcements on January 15, 2016 by moriko. -Hanaya- says it’s almost spring! If you live in the Northern Hemisphere, you might be tired of the grey blahs of winter. So our in-world store has magically turned to spring. And new -Hanaya- spring products are popping up out of the ground every day. First, a group gift for our sweet -Hanaya- VIP Group customers and friends. Being sent out on the group today, so grab it from notices if you missed your delivery. Or better yet, stop by our in-world store to see other new stuff for spring. And not forgetting Valentine’s Day, we have a free gift for anyone who pops by, and of course for our Subscribe-O friends. 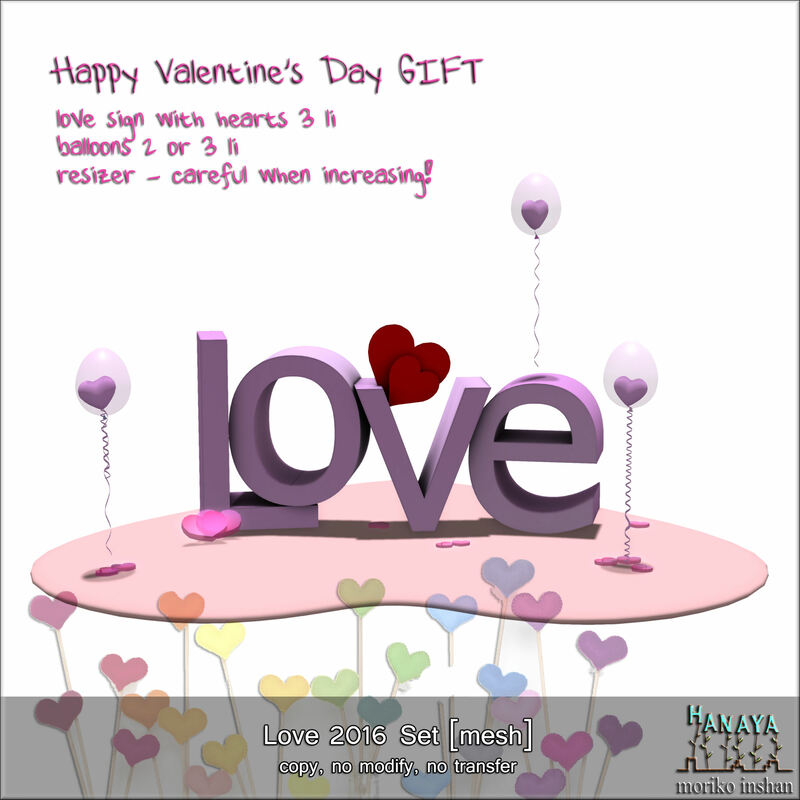 This entry was posted in Freebies and Gifts and tagged free gift, group gift on January 14, 2016 by moriko.